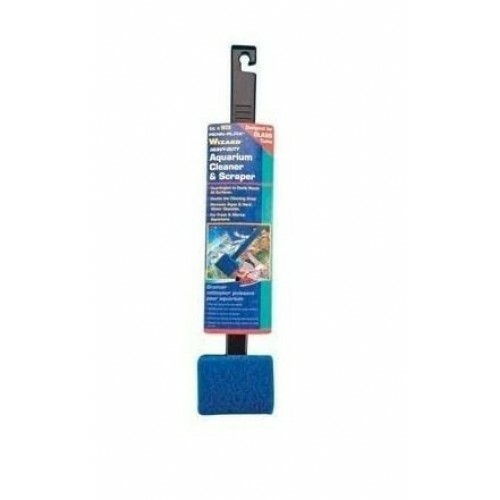 The WIZARD aquarium scrubber, made by Penn-Plax is a heavy duty algae scrubber designed for glass aquariums. The scrubber is designed with a dual angled head that will allow the aquarist to reach tuff algae spots that flat scrubbers can never get to. The dual angled head also allows for cleaning aquarium corners with ease. 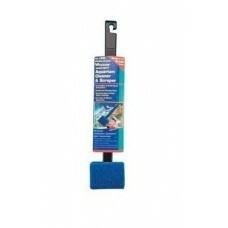 The WIZARD scrubber is double sided and this gives the aquarist twice as much cleaning surface area to work with. This will help keep the WIZARD from loading up with algae and muck. The WIZARD can be used in marine and freshwater aquariums along with outdoor pond and water features. The handle of the Penn-Plax WIZARD is made of a heavy duty ABS plastic which will allow for easy cleaning in deeper tanks. The WIZARD has a detachable scrubbing pad that will allow the aquarist to change out old and worn out pads with new fresh cleaning pads.